Stewart White hosts a debate with a live audience testing the key policies affecting the East of England. Brexit: Panel asked - is UK success actually down to immigration? Did any of the parties win anyone over? So there we conclude our BBC East general election debate. The party strategists along with political commentators were convinced that this election campaign would be all about Brexit. What was clear from tonight's debate was that the public think there are other important issues which need addressing. This audience, many of whom live in a marginal constituency (Conservative majority 2,000) were passionate about the NHS, social care, tuition fees and immigration. It was clear from their questions that they felt the parties have not been very clear about their plans. Even though the audience had been carefully chosen for balance, Brandon Lewis for the Conservatives seemed to have the hardest time from the audience. Clive Lewis probably got the best reception. All the party spokesmen argued their case with conviction - the big question is did they win anyone over tonight? Audience member Jo McKearney asked: "Is there a fairer way to deal with the cost of health care for the elderly other than the introduction of the Dementia Tax?" The Conservative Party wants to include the value of someone's home when deciding how much they must pay towards care at home - but allow them to pay after they die. The Conservatives say the changes ensure fairness across the generations, but other political parties have dubbed it the "Dementia Tax". The government-commissioned Dilnot Report into social care recommended people in England and Wales should not pay more than £35,000 for social care, but this has not been accepted. Clive Lewis (Labour) said: "Well for a start [to find a fairer way to deal with health] you should not elect a Conservative government, but elect a Labour one. "One of the reasons you're seeing such a negative campaign with Jeremy Corbyn being spat on day in and day out is that the wheels on the Conservative campaign have come off over the dementia tax." Brandon Lewis (Conservative) said: "We do need to deal with this and Clive has not mentioned a solution to the problem [of funding elderly care]. "Why should young people struggling in their first job earning £20,000 to £30,000 have their taxes pay for people in £1.5m homes? What we are doing is creating fairness in the system." Martin Schmierer (Green Party) said: "The simple fact is there is a problem here with funding gap - a shortfall of £2.6bn by 2020. Norman Lamb (Lib Dem) said: "Can anyone justify the situation where a millionaire gets all his healthcare paid for but if you have got dementia you lose most of what you have worked for through your life. "Many people are worried about the implications of this. It think it is shameful." "We thought the government had accpeted the Dilnot Report but then they come into the election with a 'back of the envelope' plan." Reality Check: Who could social care changes affect? Net migration to the UK has fallen to about 248,000 in 2016, down 84,000 from the previous year, according to official estimates from the Office for National Statistics. Net migration is the number of people who have moved to the UK for at least a year minus the number who have left. Immigration to the UK is estimated to be 588,000 - 250,000 EU citizens, 264,000 non-EU citizens and 74,000 British citizens. At the same time, an estimated 339,000 people left the country: 134,000 British, 117,000 EU and 88,000 non-EU citizens. Martin Schmierer (Green Party) told the audience he was a first generation immigrant himself, born in Germany, and that he too was "in limbo". "Immigrants play a serious role," he said. "They contribute to our economy, why should we question their commitment to this country?" A member of the audience then received applause for asking why we couldn't train our own youngsters to become doctors. Brandon Lewis (Conservative) said we had to recognise that the country made a decision last June and the Brexit process to "take back control of our borders" was under way. We have to "upskill young people," he said, claiming that two million more jobs had been created - 1,000 a day. But a retired social worker in the audience piped up that in her experience "less social housing than ever" was being built for working people - which Brandon Lewis denied, claiming the Conservative manifesto made that clear. There were heckles from the audience of "Liar! Liar!" and "Rubbish!" Another audience member asked if the UK's economic success was actually due to immigration. Clive Lewis (Labour) said a cap on immigration would not solve the housing problem. "We had to make sure everyone could access education and training," he said. "We need an economy that works, not an arbitrary cap on immigration." He added that pulling in people from poorer parts of the world meant we could educate and train them to develop their own countries. "We should not start from the point that immigration is bad, it is good for our country," he said. Next - the question that seemingly dominates every general election debate - leaving the EU. Theresa May says she called the snap election because she wanted "stability" among the parties as the departure from the EU is ironed out. Audience member Cameron Cole said it was clear from the EU referendum result in 2016 that people want immigration reform. He asked the panel how their parties each propose to tackle immigration. Norman Lamb (Lib Dem) said government had to "listen and accept and understand the message from the referendum campaign". He said it was important to help young people get the skills they need to enter a competitive jobs market and that we need workers from the EU. Four hundred workers at the Norfolk and Norwich Hospital are from the EU and not to guarantee their right to stay here was "outrageous", he said. The population has increased by four million since 2000 which he said was "unsustainable". "We need to grasp this nettle," with 600,000 coming in every year and 300,000 leaving, he claimed. Audience member Hanno Kakosch asked: Is it important to the economy to have free access to university to compete in the global market? Patrick O’Flynn (UKIP) said: "When we leave the European Union, we come away from having to offer every student from the EU the same package of funding as we offer to every student. "We will put British students first." Norman Lamb (Lib Dem) said: "We should be open to getting the best students from around the world. "I find it extraordinary that the prime minister wants to restrict the number of foreign students. Those students will go back to their countries and think well of this country." Martin Schmierer (Green Party) said: "Education should be free and remain free. "This is something the Green Party would pay for by investing in young people. We are creating a new generation of people who would be paying cash into the country [through taxation]." An audience member said she had wanted to be a chef but couldn't afford it because of the high cost of going to college. In reply Brandon Lewis (Conservative) said: "The reality is that if somebody goes to university, they repay based on what they earn. "More people from deprived backgrounds are going to university. You only pay back when you start earning." Clive Lewis (Labour) said: "We see education not as a commodity but as a right that everybody is entitled too. "We will make it free at the point of use. We have to move away from education as a commodity." The NHS in the East of England is under strain. There are staff shortages and a number of hospital trusts in deficit. Demand for treatment is rising and budgets are under pressure. The NHS and healthcare is right up there with Brexit as an issue which most concerns voters, BBC research has found. Martin Schmierer (Green Party) said the preservation of this "fundamental British institution" is about the money the Greens would pledge £20bn over five years. He said that under the Conservatives not enough money has been invested in the NHS and cited the Norfolk and Norwich Hospital where A&E is designed for 60,000 people, but sees 120,000 a year. "It is the staff keeping it afloat," he said. Norman Lamb (Lib Dem) said the party would put a penny on income tax, because the state of the NHS has "consequences for real people". He said one couple opted to go private and find the £20,000 to pay for a hip operation because the NHS wait was 26 weeks. "Everyone should get access regardless of ability to pay," he said. He added that the mental health waiting list was "appalling". Margaret Ridley, who asked the question, told the panel she felt a Conservative government would spell "the end of the NHS". Another member of the audience added that the NHS was the national health service - not an international health service. Another member of the audience described the cuts to social care as a "scandal", saying austerity had a knock-on for the mental health of the nation. To that, Brandon Lewis replied that Britain was "not living in a vacuum", but Norman Lamb said the Conservative policy was a "total betrayal" for elderly people. Margaret Ridley opened the BBC East election debate by asking what the panel would do about the state of the Cambridgeshire's three acute hospitals - Addenbrooke's, Hinchingbrooke and Papworth - which she said were among the worst in the country for A&E performance and delayed transfers of care. Brandon Lewis (Conservative) began by saying one of the key things was to get more money into the NHS, and back NHS chief Simon Stevens by putting in an extra £8bn going forward. "We need stability and planning for the future," he said. Clive Lewis (Labour) said Labour would pledge £30bn over the next five years - that it's not about the money, but about staff and staff morale. He pledged to end the 1% pay cap. He described the fact that nurses are having to use foodbanks as "outrageous". Patrick O’Flynn (UKIP) went further and outbid Labour - saying UKIP would pledge £11bn a year by reining back the foreign aid budget. He said the NHS was losing too many GPs and an "innovative plan" was needed to bring them back. Green Party representative Martin Schmierer represents the party on Norwich City Council and leads the Green Party group. Mr Schmierer, who has lived in Norwich since 1994, has campaigned for a variety of local issues including calling for safer streets and traffic calming measures and the promotion of business. In 2016 he stood as the Green Party’s candidate for the role of Police and Crime Commissioner in Norfolk. His interests include football, cinema, cooking and hiking. UK Indpendence Party representative Patrick O'Flynn was elected an MEP in May 2014, before that he was the UKIP director of communication. Mr O'Flynn went into politics after a 25 year career as a newspaper journalist working for the Sunday Express, the Daily Express - where he was chief political commentator - the Birmingham Post and the Hull Daily Mail. He is also UKIP's parliamentary candidate for Cambridge, where he was born and where he gained a degree from King's College in economics. Labour candidate Clive Lewis was elected MP for Norwich South in 2015 taking the seat from sitting Lib Dem Simon Wright. The former BBC journalist found himself swiftly appointed to the shadow cabinet before quitting over the Labour Party's decision for the whips to instruct MPs on voting to trigger Article 50 to leave the EU. Mr Lewis served with the Territorial Army in Afghanistan for three months. Conservative Brandon Lewis was elected as MP for Great Yarmouth in the 2010 election beating the incumbent Labour candidate and retaining his seat in the 2015 election. The former Brentwood councillor has a BSc in economics from Buckingham University and is also a qualified barrister. He is a minister of state for policing, having previously served as a housing minister. He lists his hobbies as running, cycling, swimming and reading. Liberal Democrat Norman Lamb was first elected MP for North Norfolk in 2001 beating Conservative incumbent David Prior by 483 votes. The former Norwich City councillor served in the coalition government becoming an employment minister in 2012 and then becoming health minister. At present he is the Lib Dem spokesman on health. In 2015, he was a candidate for the leadership of the Liberal Democrats. He lists his recreations as walking and football. Norman Lamb (Liberal Democrat), Martin Schmierer (Green Party), the BBC's Stewart White, Brandon Lewis (Conservative), Patrick O'Flynn (UK Independence Party) and Clive Lewis (Labour). One of the characteristics of this election campaign has been the amount of control exercised by the various party headquarters. Media appearances have been restricted, candidates are told what lines to take on the main issues of the day and when a big name visits - very few voters actually get to meet them in order to minimise the chance of an embarrassing encounter. 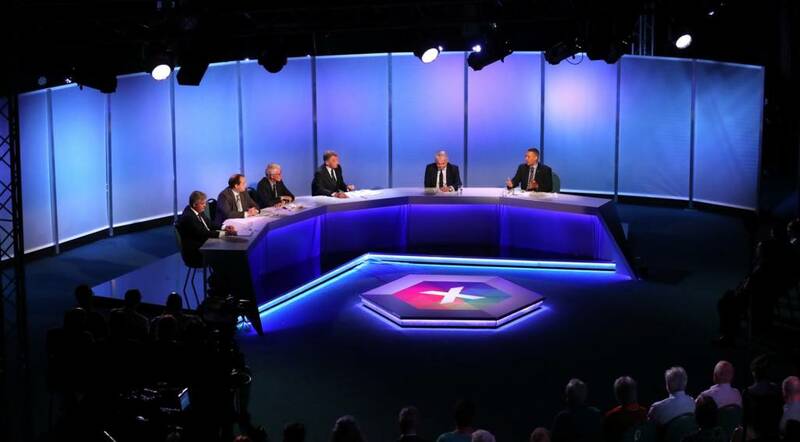 Television debates are one of the few opportunities still available for members of the public to ask senior politicians about issues which matter to them - not the party spin doctors. With a large audience watching on TV and commenting across social media, those in the hot seat know that they'll have to give proper answers. So what questions can we expect tonight? We're told that Brexit is the big issue in this election, but what aspects of it will concern our audience? What about the other big issues like the NHS and school funding? And will the politicians be able to say anything to win over voters with just over a week to go? Welcome to tonight's BBC East live page special, reporting on the issues and discussion from the television election debate to be broadcast on BBC One in the East region at 22:45. Local politicians gathered at the KingsGate Conference Centre in Peterborough to answer audience questions ahead of what is arguably the most important election for generations. You can add your thoughts as the programme is broadcast using #BBCEastDebate on Twitter, or by posting a message to our Facebook page.